I talked about the importance of Branding and New Year's Resolutions in my last post, so I thought I would post an article I wrote some time ago about how to make money from your business card by turning it into a Branding and Marketing piece. Read on for some useful tips. I love networking and meeting new people. I enjoy the pleasant etiquette of exchanging business cards. Unfortunately, I have seen some poorly designed business cards in my travels. I have been handed a boring dull business card from someone claiming to be a professional graphic designer. I have been handed a torn and frayed off-size card by someone claiming to be a marketing consultant. I’ve seen cards with outdated contact information and scribbled corrections. This article is intended to help business owners create and design a business card they can be proud to present – a card that will pass the trash test. The goal is to be memorable. What I want for you is for prospects to remember who you are days, weeks, and months after the networking event and for you to make loads of money because of your business card! 1. Don’t use plain white card stock for your business card. There’s nothing more boring than a white card. 2. Don’t use raised printing also called thermograph printing. This is considered passé. 3. UV coating is the shiny coating you see applied to many business cards. Make sure you coat only one side of your card as people like to write on cards to remember who you are and where they met you. 4. Make sure there are 3 methods of communication on your business card. Prospects have a preferred method and if you don’t include it, you may not hear from them. List your phone number, email address, and mailing address. 5. Use your business card to drive traffic to your website. Advertise on your card “download my free report” at http://www.yourwebsite.com/. 6. Use a nice quality card stock for your card. There’s nothing that screams unprofessional as a thin card. 7. Don’t list your fax number unless your business regularly receives faxes as a normal part of your business workflow. This is extra information that doesn’t need to crowd your card if not appropriate. And you won’t be bothered by fax advertising. 8. Include a Tagline on your business card. Tell your target clients what it is you do for them. This will serve to polish your image and create a brand for your company. Put your Tagline on the front of the business card. 9. Maintain a consistent brand by utilizing your unique design on both your business card and your website. 10. Keep your business card simple. Don't try to cram too much information on your card. You need some “white” space to even out the design. 11. Use no more than two fonts in your card design. Fewer fonts make it easier on the eyes. 12. Don’t use all caps on your card. All caps are difficult to read. 13. Don’t use odd sized cards. 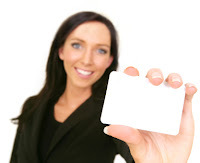 Prospect keep regular sized business cards after networking events. Odd sized cards eventually end up in the trash. 14. Use the back of the card for something useful, like a listing of the benefits your clients receive from utilizing your services. 15. If you really want to be cutting edge, use the new video business cards available today. This technology is said to be the wave of the future and especially useful if you exhibit at tradeshows. 16. Do utilize a photograph of yourself on the front of your card if you are in a relationship building profession. This helps to make you more memorable. 17. Do utilize a four color photo of your creations on the back of your card if you are in the creative professions. 18. Make sure your business card fits who you are. If you’re an artist, include a photo of your work and make sure the card has an artistic feel. If you are in a conservative field, keep the design simple. 19. Make a digital version of your business card and include it in your email signature. 20. Use a professional email address on your cards: yourname@yourdomain.com. Foxylady@yahoo.com is not appropriate for the business environment. 21. Add certification titles to your card to add credibility. 22. When handed a business card, make sure to study the card and ask questions about the prospect. This makes you a more “interesting” person. 23. When giving out business cards take them from a case and hand them to your prospect so that the card is facing up. I don’t know how many times I’ve been handed an upside down business card. 24. Include an offer on the back of your business card such as a free consultation, or free service offered in the form of a call to action. 25. Include a card with all correspondence. 26. Use a logo that is visually appealing and tells prospects what it is you do for a living. 27. Use a 4-color business card. They are not expensive and are more memorable. 28. Make sure you list your title near your name. 29. Hand out your business card as much as possible. Keep a supply in your car so that you never run out! The best advice I can give you is to use a professional to design your business card. This is a one-time investment in your company identity. Just think about the additional fees you can command when you are perceived as an expert. How much is your professional presence worth to you? A well-designed business card shows that you are a successful entrepreneur and not a fly-by-night. It also positions your business for success by presenting a clear image of a company that can be trusted. Suzanne Muusers is a Business Coach and Business Expert based in Scottsdale, Arizona. She has owned or managed a business every year for the past 25 years. She is a credentialed member of the International Coach Federation and works exclusively with entrepreneurs and financial advisors who want to leave behind their lives as business workers to become business owners earning six figures and above annually. Download her Free Report "Top 5 Business Mistakes Entrepreneurs Should Avoid" at http://www.prosperitycoaching.biz/.